There are certain movies and televised entertainments that just beg for a big platter of snacks: summer blockbusters, rom-coms, sporting events. But horror movies have never been our choice for snacking — do you really want to be snacking on guacamole while watching a zombie eat someone’s brains? Well, one restaurant is hoping this aversion to mixing horror with food isn’t the case for everyone. They’re taking inspiration from the recent Sandra Bullock-starring film Bird Box (on Netflix) for a new themed dinner. The premise? 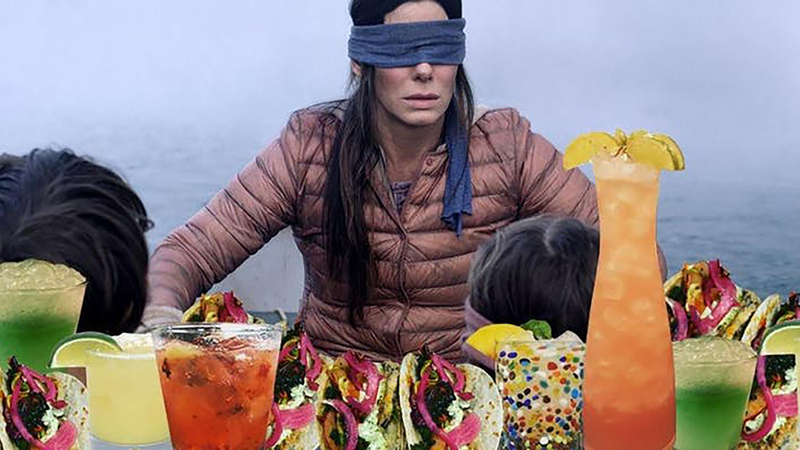 Just like in the movie Bird Box, in which Bullock and other characters wear blindfolds so as not to fall prey to a mysterious, murderous entity that kills those who catch sight of it (kind of a rip off of the basilisk in Harry Potter,TBH), diners at Guac y Margys in Atlanta, Georgia, will need to stay blindfolded for the totality of their meal. Between 7 and 8:30 p.m. EST on Jan. 24, customers will get two tacos, one dip and a margarita, all of which need to be consumed while blindfolded. There is, of course, a catch. Customers will then have to guess what kind of tacos they’re eating and what kind of marg they’re drinking, both of which will be chosen by the restaurant owner. Those who guess correctly will get a free cookie for dessert. And hopefully, won’t be murdered by a weird monster/alien when they take off their blindfolds, but really, who’s to say? The restaurant is piggybacking on “the Bird Box challenge,” a viral challenge in which people film themselves doing daily tasks while wearing a blindfold, often comically embarrassing themselves. This seems… safer. Tickets are running between $25 and $35, and only 42 seats will be available. So, if you’re interested in trying the Bird Box challenge while you eat, you’d better act now. Then again, you could always recreate the experience at home. After all, haven’t we all mindlessly snacked while falling asleep once or twice anyway? We recommend putting on your comfiest sleeping mask, grabbing a bowl of peeled grapes and putting on Bird Box for the ultimate unappetizing challenge.